The tale is told that once upon a time in Spain, the poor quality of the meals offered at wayside inns got to such a point that the guests, before tucking in, would say the verse: “Si eres cabrito, mantente frito; si eres gato, salta del plato” – which loses its rhyme in translating as: ‘If you are a goat, continue roasted; but if you are cat, hop out of my plate!’ This humorous ‘spell’ probably never worked, but it did originate a typical Spanish saying: dar gato por liebre – ‘to pass off a cat as rabbit’. The idea is quite simple: given that rabbits have a very close resemblance to cats, an unscrupulous innkeeper might succumb to the temptation of making profit by offering an inconvenient feline as prime roast hare! The saying is used to describe the malicious wile of those who offer goods and services of dubious quality as if they were the genuine article, under the facade of the most rigorous legality. May each one judge on their own if these concerns which trouble us are well-founded, because the last thing we would like to do to our readers is ‘to pass off a cat as rabbit’! The solution: a socialist agrarian reform? In the first place, Francis does not specify which are the countries where millions suffer and die from hunger. Does he perhaps refer to the thirty million Venezuelans who are victims of the Chavez-Maduro dictatorship, submerged in the worst crisis of scarcity of provisions in the history of their country, and already notified by Maduro that they should exchange their ration cards for a new digitalized system for the purchase of food products ? (Infobae (Spanish) – BBC English). 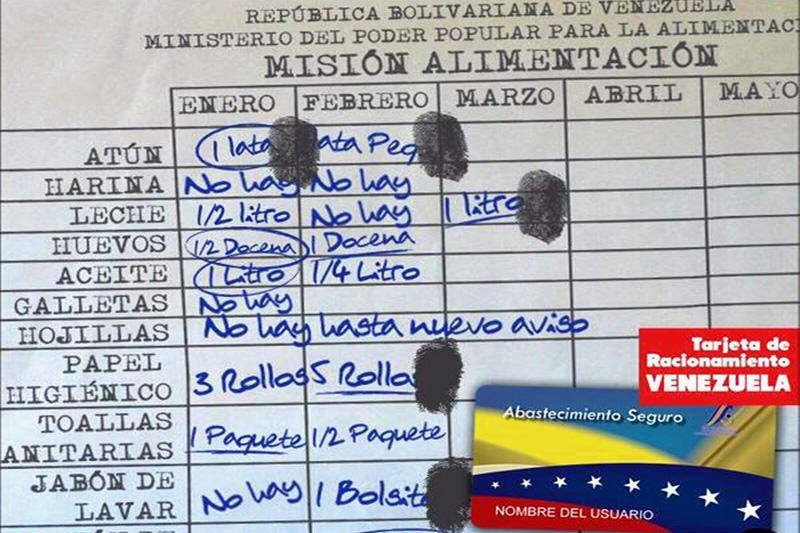 Without a doubt, digitalization is a great sign of progress…progress in the iron grip of the control and inspection of the security corps of the bolivarian socialist regime. Or is Francis perhaps referring to the ten thousand unfortunate Cubans who truly suffer hunger and extreme poverty, as declared by Archbishop Bruno Masaró when he was Apostolic Nuncio to Cuba, until the first months of 2015? Confirming the declarations of Archbishop Bruno Musaró, the UN, through the World Food Program, has presented to Cuba a program for fighting against hunger – euphemistically called “support to food security” (sic) – by which seven provinces of the island will benefit, Pinar del Río, Matanzas, Las Tunas, Holguín, Granma, Santiago de Cuba and Guantánamo. It is the ‘Country Program’ which will apply in the period from 2015 -2018 (Diary of Cuba, August 25, 2015). If ‘hunger’, in Francis’ words, ‘is criminal’, and ‘food is an inalienable right’, why, in his journey to Cuba (September 19–22, 2015) did he not make any allusion to this ‘crime’ to which Cubans have been submitted on a daily basis for already half a century? Going back to the address that Francis gave to the members of ‘Popular Movements’, we believe that no one would consider it superfluous for the Bishop of Rome, speaking of a problem that involves technical issues, to at least present a report or a specialized study about the problem of hunger affecting the world. Actually, his categorical affirmation: ‘Millions die from hunger’, stated in a public address that should tend to add something to the Magisterium, requires adequate proof. Are there countries with a food deficit? Which are these countries? What are the causes of this deficit? How many millions of people die of hunger? Were these ‘millions of people’ calculated on the basis of daily, monthly or annual statistics? As we can see, so many questions, once asked, arouse much concern, and demand exact and satisfactory answers. 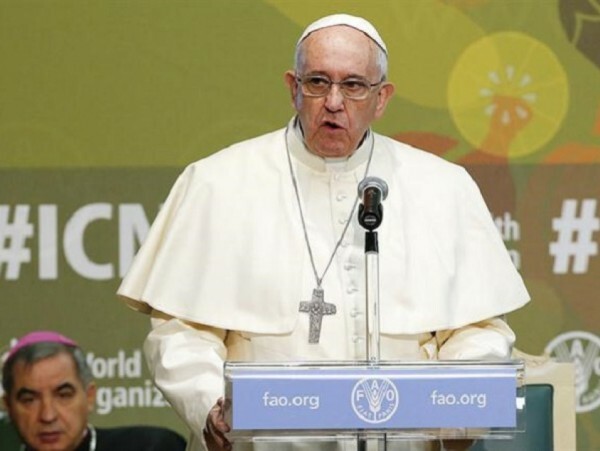 Despite the fact that Francis didn’t provide any study or specialized report on the topic he broached, it is noteworthy that Food and Agriculture Organization of the United Nations (FAO) in its last report – published precisely in Rome in 2015 – partially answers these questions. We say ‘partially’ because the UN report, entitled ‘Food Insecurity in the World, Meeting the 2015 international hunger targets: taking stock of uneven progress,’ analyzing the countries and areas affected by prolonged hunger crises, does not present data, nor statistics with regard to the ‘millions’ of human beings who ‘die of hunger’ (FAO report). In the light of this specialized technical report, what are we to think of Francis’ opinion about the hunger problem? With regards to his first affirmation: ‘Millions of people SUFFER from hunger’, there’s no doubt about it. Since the population of Cuba and Venezuela are 11.2 million and 30.4 million respectively, subtracting all the workers of the government agencies responsible for maintaining these dictatorships, we already have 40 million brothers and sisters suffering from hunger. But with regards to the second affirmation, which is serious because of its moral consequences: ‘millions DIE of hunger’, what to think of the FAO report that does not allude to such a mortality rate? Could it be that the social statisticians and economists who prepared the FAO report were lacking in scientific and technical exactitude? Who would dare to affirm something so categorically and critically without facts to support their judgment? Therefore the key question that should be asked is: Do demographic studies analyzing the problem of hunger as causing ‘millions of deaths’ exist or not? If they exist, what agency or center of studies carried them out? Are these studies reliable from a technical and scientific point of view? What is the data collected to determine the causes of this tragedy in humanity? Until these studies are presented, unfortunately there will always be mysteries regarding Francis’ categorical statements: Where do the millions die? How many millions are there? When did they die? What caused the hunger that caused their death? Although the specialists of the FAO in their above-mentioned report do not speak of ‘millions dead by hunger’, they do objectively mention a tragic happening: a famine that resulted in the deaths of more than 250, 000 people in Somalia alone between 2010 and 2012. The cause of the famine? “Natural disasters and conflicts” (page 38). Regarding this aspect it is important to recall that the specialists of the FAO indicate as the principle causes of food insecurity affecting certain countries two important factors. On one hand, violent conflicts and political unstability (pages 38-39), and on the other hand, natural disasters (page 40). Among the countries identified in 2012 as having prolonged hunger crises are: Afghanistan, Burundi, Central African Republic, Chad, Congo, Ivory Coast, Democratic People’s Republic of Korea, Democratic Republic of the Congo, Eritrea, Ethiopia, Guinea, Haiti, Iraq, Kenya, Liberia, Sierra Leone, Somalia, Sudan, Uganda and Zimbabwe (see note 58). Considering that Francis, on one hand, kept silence about the misery that Cubans have been suffering for more than five decades, fruit of socialism, we ask whether hunger is or is not “criminal”, and whether food is “an inalienable right”? On the other hand, since he did not demonstrate in an unquestionable way his opinion about the cause that provokes “millions of deaths by hunger”, let each one judge for himself. Is it valid to ask ourselves the famous question found in the title of this study? Note: Who are the people who are close to Francis? Considering the ensemble of 86 organizations that participated in the First World Meeting of Popular Movements, without a doubt the group with the most ‘drive, dedication and thirst for justice’ was the MST – Movimento sem Terra (Landless Workers Movement) of Brazil. Their revolutionary conquests in their ‘curriculum vitae’ total: 2,500 (illegal) occupations of land, 7.5 millions of hectares of land occupied, and 900 camping grounds (source: movimientospopulares.org). They are successes that would make just as proud Marx, Lenin, Stalin, Mao, as Ché Guevara, Chávez, the Castro brothers, Maduro, Evo, etc. “And let me tell you that in some countries – and here I cite the Compendium of the Social Doctrine of the Church – ‘agrarian reform is, besides a political necessity, a moral obligation’ (Compendium of the Social Doctrine of the Church, §300). Has Francis read the whole Compendium of the Social Doctrine of the Church (CDSC)? It is suggestive that once again we encounter an affirmation that requires some clarification. Furthermore, as we can see, the very citation used by Francis goes against his own argument. Number 300 of the Compendium of the Social Doctrine of the Church, cited by Francis, actually does refers to agrarian reform. However, reading the document cited by the Compendium – and which Francis probably either did not read or did not wish to read entirely – points towards two important topics. These are far from and contradict the ideological principles on which is based the classical Socialist agrarian reform, and which is defended by the ‘Popular Movements’, specifically by the members of the MST- Brazil who gleefully listened to Francis’ address, and who now must feel especially encouraged to continue with their criminal activities…with the Pope’s support! The same no. 300 of the CSDC citing in no. 35 of the above-mentioned document, concludes that agrarian reform is (as Francis cited): ‘a moral obligation more than a political necessity’. However, the document concludes: ‘Since the failure to enact such reform is a hindrance in these countries to the benefits arising from the opening of markets and, generally, from the abundant growth opportunities offered by the current process of globalization’. Therefore, no. 300 of the CSDC (on referring to numbers 13 and 35 of ‘Towards a Better Distribution of Land…’) promotes private property and at the same time an agrarian reform that has as its objective to take advantage of the benefits derived from ‘the opening of markets’, which is to say, the commercial transactions of goods or services, as well as, from the abundant growth opportunities offered by the current process of globalization. Is that right? The market… Francis’ bête noire!!! In other words, no. 300 of the CSDC read in its entirety, promotes an agrarian reform based on prívate initiative, insisting on the juridical and economic favoring of the rural land owner. At the same time, it encourages the land owner to obain profit and grow economically…. (a calamity for the so-called Popular Movements!) And worst of all, according to the ‘demonic’ structures of private capitalism, in other words free market and globalization. In effect, the socialist agrarian reform promoted by the ‘Popular Movements’, (especially by the MST-Brazil, since it is a group with Marxist ideology), promote communitarism which denies any private economic growth. Following the Cuban model, the socialist state is the only land-owner, and the only owner of goods produced – in short, the worn-out Capitalism of the State. Is this what Leo XIII taught in his Encyclical Rerum novarum when he gave origin to the Social Doctrine of the Church? Was it a socialist economy that all the later Popes called for? Is communism what is taught by the Compendium of the Social Doctrine of the Church?With all due respect, and with no intention to offend, perhaps Francis should read the Compendium of the Social Doctrine of the Church, because what is written there does not coincide with his teachings, no matter how much he may insist that it does, as he did in a recent in-flight press conference on his way to the United States. Or are we being taken for a ride and receiving cats as rabbits? The other dimension of this already global process is hunger. When financial speculation manipulates the price of food, treating it as just another commodity, millions of people suffer and die from hunger. At the same time, tons of food are thrown away. This constitutes a genuine scandal. Hunger is criminal, food is an inalienable right. I know that some of you are calling for agrarian reform in order to solve some of these problems, and let me tell you that in some countries – and here I cite the Compendium of the Social Doctrine of the Church – ‘agrarian reform is, besides a political necessity, a moral obligation’ (Compendium of the Social Doctrine of the Church, § 300).